Updated at 3:51 p.m. Eastern. A massive oil spill in the Gulf of Mexico that has become far worse than initially thought crept toward the coast Thursday as government officials offered help from the military to prevent a disaster that could destroy fragile marshlands along the shore. Speaking Thursday morning to CBS News, Doug Suttles, chief operating officer for BP PLC, which leased the sunken rig, backed away from his company's denial of Coast Guard claims a day earlier suggesting the five-fold jump, telling "Early Show" co-anchor Maggie Rodriguez, "we think the range has increased" to "somewhere between 1,000 and 5,000 barrels" per day. "In terms of our response, it actually doesn't change based on that number," Suttles said. Speaking to NBC, Suttles said BP was "happy" to accept an offer for military help containing the oil slick from the federal government, which his company had politely declined on Wednesday. The federal government made the offer after it was determined the slick now poses a direct threat to the U.S. shoreline, with some of the sticky crude forecast to make landfall as soon as Friday. Coast Guard Rear Adm. Sally Brice-O'Hara said at the White House that the government's priority was to support the oil company BP PLC in employing booms, skimmers, chemical dispersants and controlled burns to fight the oil surging from the seabed. The Coast Guard has urged the company to formally request more resources from the Defense Department. President Obama has dispatched Homeland Security Secretary Janet Napolitano, Interior Secretary Ken Salazar and Environmental Protection Agency administrator Lisa Jackson to help with the spill. The president said his administration will use "every single available resource at our disposal" to respond to the spill. The Navy is sending 66,000 feet of inflatable boom and seven skimming systems, and using its bases in the region as staging areas for the operation. 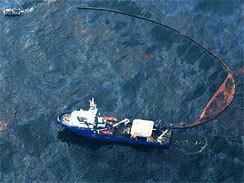 But time may be running out: Oil from the spill had crept to within 12 miles of the coast. Meanwhile, the Obama administration said the cost of cleaning up the spill will fall on BP. Louisiana State Wildlife and Fisheries Secretary Robert Barham told lawmakers federal government projections show a "high probability" oil could reach the Pass a Loutre wildlife area Friday night, Breton Sound on Saturday and the Chandeleur Islands on Sunday. The sinking of the Deepwater Horizon rig has re-ignited the debate over offshore drilling, reports CBS News Correspondent Don Teague. In the Gulf alone, there are more than 3,500 oil and gas platforms with about 35,000 offshore workers. They produce more than 1.7 million barrels of oil per day, almost 30 percent of total domestic production. Environmental groups say the disaster proves offshore drilling isn't worth the risk, Teague reports. In a reversal of his stance on the topic, Florida Gov. Charlie Crist said Thursday after flying over the oil slick in the Gulf that he would no longer seek offshore drilling for his state. Crist said the disaster proved that oil rigs are "the opposite of safe."